It's a once in a lifetime event for cycling fans - but if you haven't yet entered September's 2019 UCI Road World Championships Sportive, time's running out: the ballot closes at 11:59pm tonight. Experience the UCI Road World Championships and ride the course in Harrogate this September. Taking place in Harrogate on Sunday 22 September 2019, the official sportive of the 2019 UCI Road World Championships offers cyclists a chance to experience the course and take in the action as the pros battle for the coveted rainbow jersey. 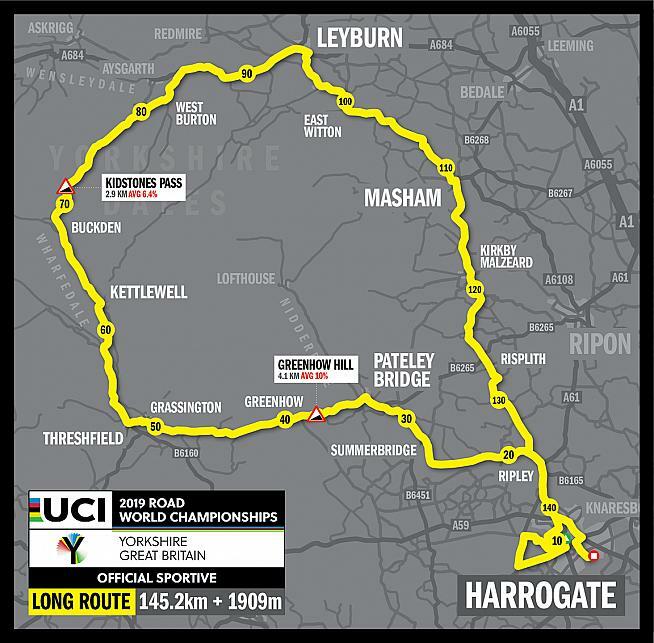 Choose from three routes, Long 145km; Medium 98km; and Short 72km, each of which include a closed-road lap of the Harrogate town circuit before the pros. The debut edition of the Mixed Relay Team Time Trial will follow after the sportive, also departing from Harrogate ensuring the sportive will get the classic Yorkshire welcome and support. The entry ballot is open until midnight Wednesday 20 March at worlds.yorkshire.com/sportive. Entries are priced £67.50 for the long and medium routes and 57.50 for the short course. A team ballot is also available for groups of 2-4 riders wishing to take part: if one rider is successful in the ballot, then all team members will be assigned a place. Successful applicants notified by 4th April. For more information and to sign up for 2019, visit worlds.yorkshire.com/sportive/ballot-tickets-and-pricing/.